SEA ICE comes in a convenient wax form. Just rub a little on the surface of the glass or plastic lens with a clean, damp cloth and gently buff. SEA ICE disappears quickly and will leave a distortion free residue of specialized neutral, nonionic wetting agents that sheds moisture vapor instantly. 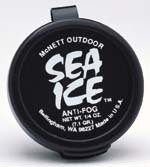 SEA ICE is designed for the serious sports enthusiast who will demand more from a fog and moisture elimination product. SEA ICE is available in a handy pocket sized polycon container so you can carry it with you always.